Mini-Circuits has released PWR-6G+ which is a multi channel USB power sensor with a 50dB dynamic range. The mini-circuits USB power sensor comes with a power meter software that turns the PC/Laptop into a power meter. 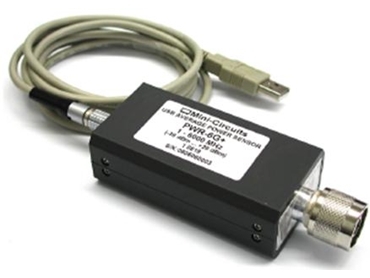 PWR-6G+ does not require any reference signal calibration and has a frequency range of 1 to 6Ghz, with 50 ohm impedance, typical vswr 1.1:1 and accuracy +/-0.15dB. No external power source is required and it is easy to install and operate. The PWR-6G+ can measure up to 10 channels in parallel and take measurements relative to previous results. With printable data and graphs available, PWR-6G+ is a low cost replacement solution for the conventional power meter. PWR-6G+ is available from Clarke & Severn Electronics .